Maximus Arcade is a commercial Frontend software that allows for seamless interaction with multiple arcade and console emulators while keeping the Windows environment hidden. Although best suited for use in arcade cabinets, it can be configured for use in a kiosk or simply running on a computer with a keyboard, trackball, or game pad. Maximus is the only frontend that you have to pay for, but its features make it well worth considering. Only enable and set up one emulator at a time or you will have problems! Start with MAME which is enabled by default (under the Display Order Tab). Never add add anything to the optional lines (Image/Movie/Marquee) until you have the emulator working with a few ROMs! If you have any lines pointing to a folder that does not have any valid files that Maximus is looking for you will get the Invalid Media Locations error! For this reason only add one line at a time and test it before adding more. If you need more help see the Troubleshooting section below and the official Maximus Arcade Documentation and Help. We do not offer any support for Maximus Arcade, only our hardware. Download Maximus Arcade (30 day trial), Extract to the default Destination Folder which is c:\ (NOTE: If you extract it to a different drive/folder you will have to figure out how to edit the batch files for that on your own). Once extracted, we would recommend going to the C:\MAX 2.10\Frontend\ folder and right-clicking on both Maximus Arcade.exe and Preferences.exe and choosing 'Send To' > 'Desktop (create shortcut)' which will do just that. In the C:\MAX 2.10\Frontend\ folder run the Preferences.exe. Under the 'Display Order' tab you will see that MAME is already enabled by default. Don't add any more yet, and never add more than 1 at once and only after you've verified the ones you do have enabled are working. Preferences is also where you can make changes to the controls for the Maximus Frontend, but by default it's already set up for X-Arcade use. Under the 'Configuration tab' (with 'Configuration for' set to 'MAME') you will see that the ROMs folder is set to C:\MAX 2.10\MAME\roms\, which is where you will want to drop some ROM files (don't unzip them). With ROMS now added, run the Maximus Arcade.exe and wait for it to search for your games (black screen) until is opens. If you get an error now, you likely didn't add any proper ROMs or you need to read the Important Notes at the top. When you add more ROMs, you will need to open Maximus Arcade, right-click anywhere on the screen and choose "Refresh Game List". Alternatively open Preferences (Use the keyboard's RIGHT-SIDE CONTROL KEY (NOT LEFT) CONTROL+P while in the front end, or the Preferences link found at C:\MAX 2.10\Frontend) and choose the Configuration tab. Next to "Configuration for" choose the emulator you want to look for new ROMs in (example MAME) from the drop-down list. Next click on the "Scan" tab at the bottom, and put a check next to "Force rescan of media folder". Close preferences, your screen will be blank for a few minutes while it is updating. If your ROMs don't appear or don't work see our ROMS page. NOTE: Upon first launch you will get a black screen while Maximus does its initial scan of your games, and anytime you tell it to scan for new games. Invalid Locations: When you add an emulator to Maximus it's going to also add a ROM directory for you as well as possibly some media directories. If you have a ROM/media location set that doesn't have any valid file types in it you will get the Invalid Locations error. So for example, if you have a directory set for Image or Movie but don't have any correct images/movies in that folder (or they are not named correctly), you will get the error. For this reason, always start with just the emulator.exe location and ROMs directly ONLY, and make sure that works before adding more directories for media. And obviously ONLY ADD ONE EMULATOR AT A TIME! 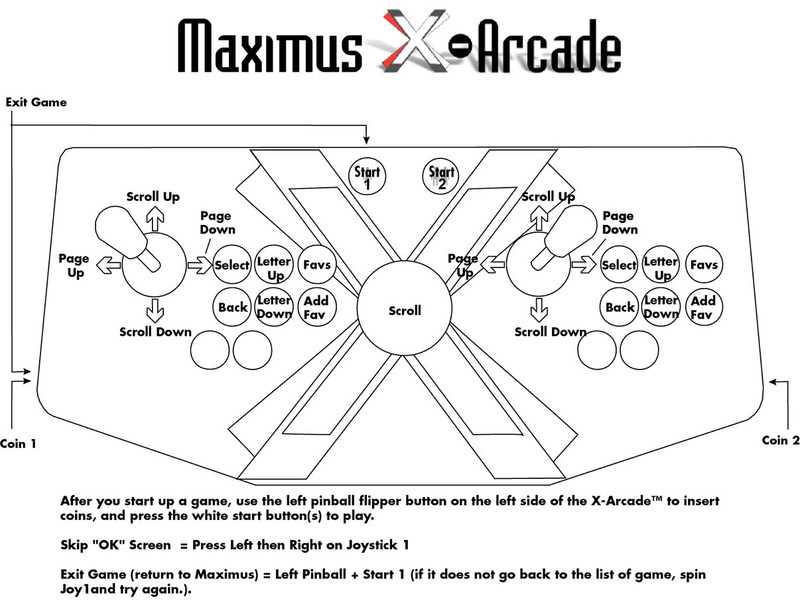 There is a known Windows software bug with exiting Maximus Arcade on older model X-Arcade controllers, click here for info and workarounds. Disable 'Sticky Keys' and 'Filter Keys'.